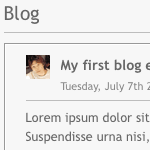 The blog offers a possibility to easily publish own content like in a diary or journal. Write about topics you currently have on your mind. When writing a blog article you may select categories and tags. Other users of the site can comment your articles.